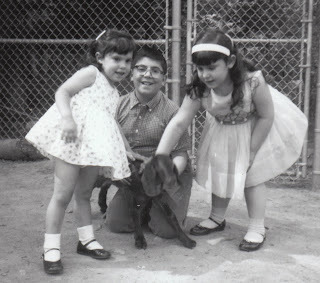 My Papa, Pasquale Joseph Galante, died last week at the age of 86. I hope no one will mind if I take a some time to write about him here. Papa was my mother's father. He was born in Brooklyn, NY in 1922, the second of five children. His family moved to Waterbury, CT when he was little. In 1942, he was drafted, but he always preferred to say that he "received a personal invitation from President Roosevelt." He was trained as a radio operator and served as a Staff Sergeant with the Army Air Corps in China-Burma-India in 1943 and 1944. As a member of the 14th Air Force's 27th Troop Carrier Squadron, Papa flew in C-47s over the Himalayas in order to bring troops and supplies to the Chinese Army. He flew this route, called "The Hump," dozens of times. During his service, Papa won many medals, including the Distinguished Flying Cross (twice), the Air Medal (twice), the Purple Heart, and several medals from the Chinese government. His favorite medal was the Good Conduct Medal, which he would bring up for years afterward whenever he was caught redhanded in some sort of mischief. He was shot down in Burma in 1944 and contracted malaria as he walked through the jungle back to the nearest US outpost. During this ordeal, he was shot in the face and lost all but a few of his teeth. He wore his government-issue dentures from 1944 until the late 1990s, when a horrified orthodontist convinced him to get some that fit properly. Papa insisted his old ones were just fine. After he made it back to his unit, Papa was sent home to the US, where he was assigned the awful duty of notifying families when their loved ones were killed, wounded, or missing. 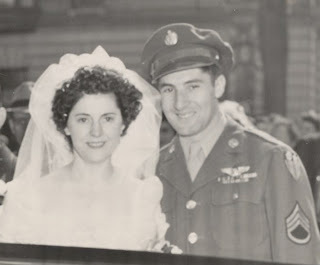 On May 5, 1945, he married my Naunie (his younger sister's best friend from high school). They were on their honeymoon in Atlantic City on VE Day. After the war, Papa worked for the State of Connecticut as a purchasing agent. He and his brother, Phil, and his best friend, Jerry, were always on the lookout for surplus anything, and working for the state put him in a good position for salvaging things. My mom says that it was years before she realized that tuna came in cans smaller than No. 10. When I was little, the tables at our family picnics were made out of old road signs that the three of them had found somewhere. My first apartment was furnished in part with chairs and end tables with "University of Connecticut" stamped on the bottom. Naunie and Papa had three kids: my uncle Rich, my mom, and my aunt Chelle. They lived in Waterbury, where the kids went to Catholic school and wore stupid outfits in the '60s. Later, all three kids went to college and each got married soon after graduation. 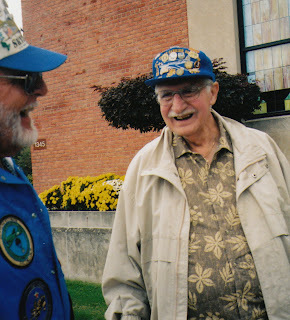 Papa loved going to reunions with his WWII buddies. He absolutely refused to fly (the last time he was in an airplane was 1945), so he and Naunie would drive all over the country. Sometimes, the whole family would go along — I've been to reunions of his in Maine, Richmond, and DC. In 2002, we all went to DC because his unit was dedicating a memorial tree in front of the chapel at Andrews Air Force Base. I remember being surprised because the guards didn't check any of our IDs at the gate (we were on a bus with the veterans), and they let us get within a hundred yards of Air Force One. 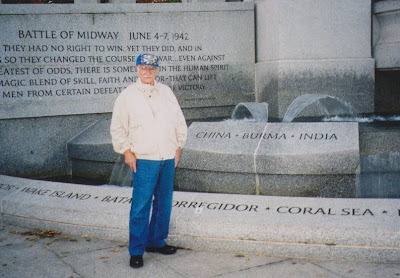 While we were there, we took him to the WWII memorial on the mall. His schedule was packed with reunion activities, so we had to visit at 6 in the morning. We had the whole memorial to ourselves and got to watch the sun rise over the Washington Monument. 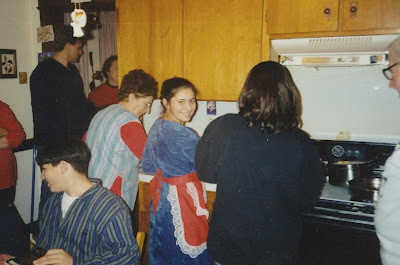 This blog post is too long already, but there are so many stories I could tell about him. He took me to my first game at Yankee Stadium. Once, he stood as best man for a friend who was marrying a divorced woman when no one else would. When Carmine Galante was assassinated, Papa made a very nervous waiter set an extra place for "Uncle Carmine" at an Italian restaurant in New York. Any time he went anywhere, even to other states, he would invariably run into someone he knew and would spend hours catching up. I'll post the official obituary later, but for now I'll just say that he was the best grandfather anyone could hope to have and that we'll all miss him terribly. If I don't post much over the next few days, it's because I'm off doing funeral-related stuff. I've set a few posts up to auto-post, but there may not be much action here until next week. I stumbled on your blog recently and was fascinated with your topic. I'm so sorry to read about your loss. 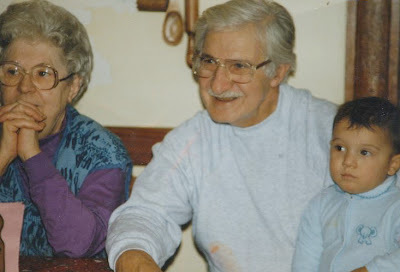 Next week will be the 1yr anniversary of my own grandmother's death so I know how difficult this must be for you. All the best to you and your family as you celebrate his life and cope with the tremendous loss. I hope you'll come back when I get back to blogging on my usual topics! Your blog touched me. My father was also a Staff Sargent and radio operator with the 27th Troop Carrier in CBI. He's gone now, but I remember how he wept when describing his comrades who died in bad weather, mountain crashes, and enemy fighter attacks.